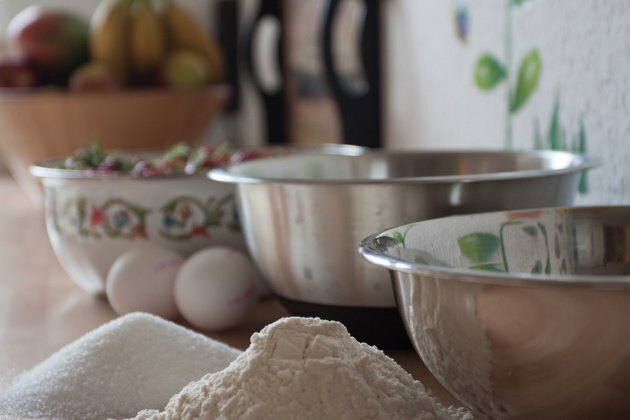 If you are baking a cake that needs to be round or dome-shaped, use a mixing bowl instead of a traditional cake pan. This will save yourself the time and effort of carving your shape. When selecting a mixing bowl to bake in, be sure it is oven-safe. There should be indication of this on the bottom of the bowl. According to chef Sandra Lee, your cake may take longer to bake in a bowl than in a pan. Be prepared for up to 20 minutes of additional baking time. Grease one of the mixing bowls with butter, and coat with flour to prevent sticking and set aside. Combine cake mix, water, oil and egg whites in second mixing bowl, according to the cake box directions. Pour the prepared cake mix into the greased and floured bowl, then bake for 40 to 50 minutes. The cake is fully cooked when a toothpick inserted into the center of the cake comes out clean. Remove cake from the oven and let it cool for 10 minutes. Remove from pan and let the cake cool completely, for about 30 minutes, before attempting to frost and serve. Cooking spray could be used instead of butter to grease pan if you are using a steel mixing bowl. Do not use cooking spray on a glass or ceramic bowl.